To create safe, bikeable, walkable communities in Collier County. We envision the greater Naples area with a world class infrastructure that provides a connected network for walking, biking, and running. While Florida has the perfect climate for outdoor activities, it is the deadliest state in the country for pedestrians and bicyclists. In 2002, Rich Housh, Doug Finlay, George Dondanville, and Joe Bonness and a few others decided to organize an advocacy group for bicyclists in Collier County. At the same time, Alan Ryker was organizing an ad hoc group of concerned citizens to advocate for a sidewalk plan in Naples. Realizing that they had interests in common, the two groups began meeting together. As the combined group grew and became more visible in the community, it drew the attention of Preserve Paradise, an organization that opposed sidewalks. In order to counter the Preserve Paradise movement, the ad hoc committee applied for 501(c)(3) status to raise funds and have official standing in the community as Naples Pathways Coalition (NPC). In 2005, NPC officially incorporated. 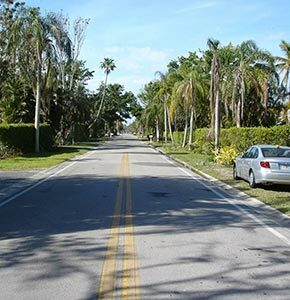 The debate over creating sidewalks lasted several years prompting the City of Naples to hire consultants Kimley-Horn to do a bicycle/pedestrian study. With extensive NPC and community involvement the City of Naples Pedestrian & Bicycle Plan was developed and adopted and a funding stream secured. NPC continued its advocacy work expanding its scope to include Collier County and working with the Collier Metropolitan Planning Organization to create its Comprehensive Pathways Plan. Through its ongoing efforts, Naples Pathways Coalition is making significant progress in creating safe pathways. See What We Do to learn more about what NPC has accomplished since its inception.